UAE Founding Father Sheikh Zayed attends a meeting with the citizens during one of his tours in Ghayathi on May 15, 1976. Real wealth is not material gain but found in the people who will build the future of their nation – that was the Founding Father Sheikh Zayed’s message from the moment he became Ruler of Abu Dhabi, then President of the UAE, and it is now his legacy. Today marks the 52nd anniversary of Sheikh Zayed’s Accession Day, the day he assumed leadership in Abu Dhabi on August 6, 1966, marking the start of a new epoch in the history of the UAE. It is a day that will forever remain in the hearts of Emiratis, said Sheikh Mohammed bin Zayed, Crown Prince of Abu Dhabi and Deputy Supreme Commander of the Armed Forces. "Nations and people remember their symbols and the makers of their glories and keep their achievements immortal in the memories of generations. It was a sentiment shared by Sheikha Fatima bint Mubarak, wife of Sheikh Zayed and chairwoman of the General Women’s Union. “On this day, which is renewed every year in my memory, I believe that the wisdom of God made August 6 the beginning of a new historical phase in our lives, a great transformation and a transition from the past to the prosperous present,” she said. Sheikha Fatima, also president of the Supreme Council for Motherhood and Childhood and supreme chairwoman of the Family Development Foundation, said the willpower and visionary mind of Sheikh Zayed transformed the harshness of the past into a bright future, with achievements that have become an ideal model for other countries. Last year, President Sheikh Khalifa marked the anniversary of his father’s accession by declaring 2018 the Year of Zayed. This year, it was commemorated in Dubai with the completion of a 140-metre mural that will be displayed on the outer wall of Dubai Ladies Club in Jumeirah for a year. The mural was painted by 22 students from the College of Arts and Creative Enterprises at Zayed University in Dubai and conveys four main themes inspired by the UAE Founding Father’s values: wisdom, respect, sustainability and human development. Sheikh Zayed’s accession represented the beginning of the ruler’s influence, both within his emirate, and eventually his country, and across the region. Shortly after assuming the leadership of Abu Dhabi, Sheikh Zayed held an open majlis for his new subjects at Qasr Al Hosn at which he shook hands with 637 people in a single day. Immediately after, he was tasked with establishing a new administration capable of rolling out the emirate’s new economic base and infrastructure. One of the earliest decrees, issued only 12 days after Sheikh Zayed’s accession, appointed Sheikh Khalifa, his eldest son and the current Ruler of Abu Dhabi, as his replacement as Ruler’s Representative in the Eastern Region. It also appointed other members of the Nahyan family to positions of responsibility and influence. Two years later, Sheikh Zayed and Sheikh Rashid bin Saeed, then Ruler of Dubai, met in a simple tent in the desert between both emirates and reached a formal agreement that would bind them together and lead to the formation of the UAE on December 2, 1971. Early on, Sheikh Zayed recognised the importance of extending bridges of co-operation and communication both within his country and with all Arab nations. In August 1974, he travelled to Tunisia, Morocco, Libya and Egypt to lay the foundations for diplomatic and political ties that remain to this day. During the Non-Aligned Movement Summit in Colombo, Sri Lanka, in 1976, Sheikh Zayed supported the struggle of the Palestinian people and their right to statehood. On August 1, 1973, issued a decree establishing the Federal Supreme Court as the highest judicial body in the UAE. Four days later, he formed the Zayed bin Sultan Al Nahyan Charitable and Humanitarian Foundation, that continues to help underprivileged people within the country and abroad. 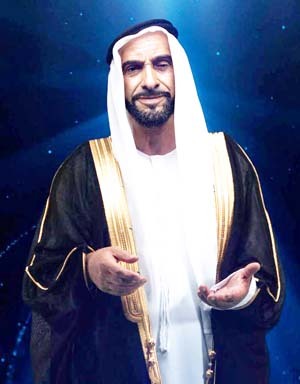 Sheikh Zayed also expanded the UAE’s development and humanitarian assistance overseas. On August 1, 1973, he issued a decree establishing the Federal Supreme Court as the highest judicial body in the UAE. Four days later, he formed the Zayed bin Sultan Al Nahyan Charitable and Humanitarian Foundation, which continues to help underprivileged people within the country and abroad. On August 1, 1990, he financed the reclamation of 76,080 hectares of land and construction of hotels to promote tourism in Egypt. A year later, on August 3, he laid the foundation stone for the Sheikh Zayed Hospital in Rabat, Morocco. Sheikh Zayed also donated $5 million (Dh18.3m) to the Organisation of Islamic Conference and its Islamic Solidarity Fund on August 24, 1997. Two days later, he gave $15m to support the Palestinian people and confront the economic siege imposed by Israel. His legacy extends across regional and international levels, creating a lasting and positive impact on the world, state news agency Wam reported. Yesterday, Sheikha Fatima said Emiratis were fortunate to be led by rulers who had followed the approach of the late leader in providing all means of progress and support. “Sheikh Zayed created a miracle on the UAE’s land,” she said.